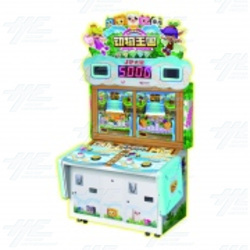 Animal Kingdom 2 Player Arcade Machine is a push and drop cube game similar to the popular Tetris video game. It is designed for two players and can be linked with another cabinet for four player compatibility. In Animal Kingdom, different drop cubes fall down the playfield in the same fashion as traditional Tetris, however the game includes a number of exciting mini-games to keep players strategizing and engaged! Animal Kingdom is fun and challenging for people of all ages and skill levels, and will attract players from all across the floor. Animal Kingdom is a bright, attractive upright cabinet which features a High Definition 42” LCD screen, colourful LED lighting, and a new type of turn dial control. Animal Kingdom Push and Drop Cube Game features a number of interesting features for players to enjoy, and players must strategize about where to place different types of cubes (such as treasure box cubes and drop animal cubes) in order to get prizes, more plays, or bigger payouts!